Linear eMerge access controllers don’t require any special software to be installed on the customers computer. Each controller has a built-in web server which allows the user to program or monitor their system with any device with a web browser, such as a computer, tablet or smart phone. 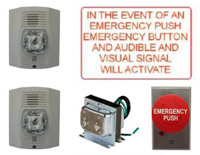 eMerge access control panels can communicate with each other through a buildings computer network cabling, or over the internet, so installation costs are reduced. Visit the Linear eMerge E3-Series product feature on this web site. For pricing, availability or more information about eMerge access control products, or this promotion, please contact K.M. Thomas customer service at 1-888-383-4105. * Taxes and shipping charges extra. Subject to change without notice. Available for shipments within Canada only.